WESTMINSTER, Colo., Nov. 16, 2017 /PRNewswire/ -- Camp Bow Wow®, the nation's largest Doggy Day Care and Boarding franchise, successfully completed its multi-faceted #GiveAFetch campaign, a dynamic experiential activation aimed at furthering Camp Bow Wow's commitment to corporate social responsibility. As a result, the company donated $50,000 to shelters and rescues across the country, in addition to awarding two lucky recipients with a free year of Camp services. 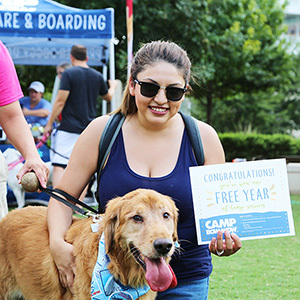 The $100+ million-dollar company, which ranked #1 in the pet category on the Entrepreneur Franchise 500 list for 2016 and 2017 and named in Entrepreneur's 2017 Best of the Best List in pet services, jump started the campaign at the end of September with a weekend-long celebration in parks across five cities. Following the events, the brand hosted an interactive social media contest, encouraging pet parents nationwide to post photos on social media showing how they #GiveAFetch about their furry friends through the end of October. 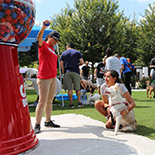 As part of the dog-friendly kick-off events hosted in Atlanta, Cleveland, Denver, Dallas and Northern New Jersey, the Camp Bow Wow team debuted a giant 7 ft. tennis ball dispenser in each city that held over 2,000 tennis balls. For every tennis ball dispensed, Camp Bow Wow donated $5 to a local shelter of the user's choice, amounting to a total of $50,000 for the whole campaign. The larger-than-life dispenser, which also doubled as a photo booth, held a single "Golden Tennis Ball," awarding a free year of camp to one lucky dog. Between the local shelters/rescues on-site, food trucks, caricature artists and notable Instagram dog influencers present at each event, the parks attracted a total of 4,000 attendees nationwide and 58 dogs ultimately found their fur-ever homes. In order to further entice dog owners across the country to share how much they care about their dogs and show how they go above and beyond for them, Camp Bow Wow hosted a social media contest for a chance to win a full year of Camp. More than 6,000 pet lovers across the country proved how they #GiveAFetch on Facebook, Instagram and Twitter. The myriad of responses from pet owners was heartwarming, resulting in a 37% increase of followers on Camp Bow Wow's Instagram page since the campaign was announced at the end of September. Entries comprised of photos of newlyweds gifting a stuffed animal replica of their pup as a wedding party favor, pooches getting treated to their favorite dog-friendly ice cream, pet parents showing off custom dog houses and agility equipment they created for their furry friends and an array of additional posts, encompassing all that dog owners do for their four-legged family members. In addition to the "Golden Tennis Ball" winner from the kick-off event, another lucky dog that emerged from the #GiveAFetch campaign was Gus, along with his owner, Colorado Springs resident, Rachel Gonzales. Thanks to Rachel's commitment to treating her adopted pup, Gus to his love of scrambled eggs on a weekly basis, the two were chosen as winners of the social media contest, scoring Gus a free year of Camp. "We are so proud of the way the entire #GiveAFetch campaign panned out and loved seeing how so many pet parents across the country celebrate their furry friends every day," said Julie Turner, Camp Bow Wow's Vice President of Marketing. "It was important for us to not only encourage pet owners to go the extra mile for their dogs, but to also raise money and awareness for local shelters and rescues – which we are proud to say, was accomplished." Through the #GiveAFetch program, Camp Bow Wow not only succeeded in encouraging responsible pet ownership while celebrating the special things we do for our dogs, but also proved to be a "leader of the pack," inspiring pet lovers across the country. Camp Bow Wow offers dogs a safe place to play while simultaneously offering socialization, exercise, and TLC from certified Camp Counselors. The company's vision of "Happy Healthy Pets, Happy Healthy People" was further exemplified by the collaborative effort of the brand's corporate team and franchise network, making the entirety of the #GiveAFetch program a huge triumph.